Helping people is our goal, not selling a service. Respect every person's contribution. No position is more or less important than another; every job is important to the success of the company. Be grateful for your blessings and share with others. The Winter’s would never ask you to do something they have not done or would not be willing to do. Use debt sparingly and pay your bills promptly. These core values and beliefs form the foundation of our distinctive difference - the combination of unsurpassed equipment quality along with industry leading customer service. With this solid foundation enmeshed in our company's culture, K. Winter Sanitation Inc., has grown to over 25 employees. 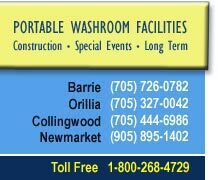 K. Winter Sanitation Inc. believes every constuction worker in Ontario should beable to use a clean portable toilet with clean-up facilies inside the unit with heated warm or cold water sink to wash their hands to avoid infectious disease and occupation hazards on a job site.